Saint Andrew Church in Dix Hills NY was blessed with a visit on January 5- 6 by Bishop Michael for the celebration of Holy Theophany. 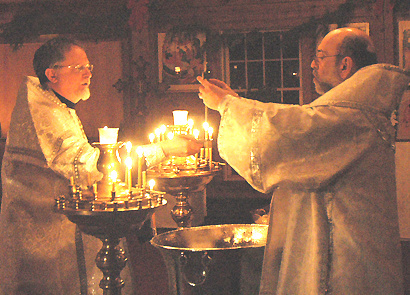 The visit began Thursday evening with festal Great Vespers and the Great Blessing of Water, and continued Friday with the Hierarchical Divine Liturgy and a festive meal. His Grace celebrated the services with Archpriest John Klingel (parish rector) and a good contingent of parishioners who admirably made the effort to take off work and school to participate in the feast. The festal joy was palpable as hymns of Theophany were sung in the candlelit church. His Grace blessed the temple and parish hall; parishioners prayerfully greeted their Archpastor and drank deeply of the newly-blessed waters. All appreciated the time “Vladyka” spent with the parish, manifesting the episcopal ministry through his prayer, teaching, encouragement, and fellowship.